The followings are articles related to anti-nuke actions in Japan on March 11, 2012, the first anniversary of the East Japan earthquake, massive tsunami and the nuclear disaster in Fukushima. So many people took to the street in main cities in Japan in order to demand the immediate shut-down of all nuclear power plants in Japan. Especially in Koriyama-city of Fukushima prefecture, where 50 km away from Fukushima No.1 Power Station, around 16,000 people joined the rally to show their demand: All nuclear power plants should be shutted down immediately! ; Stop re-operation of suspended reactors! ; and Implemented full compensation for the victims of the nuclear disaster in Fukushima!, etc. AWC-Japan are engaged in the growing movement against nuclear power plants positively. I also attach files of photos of anti-nuke actions in different cities in Japan that were held on the last weekend of March 10-11, 2012. 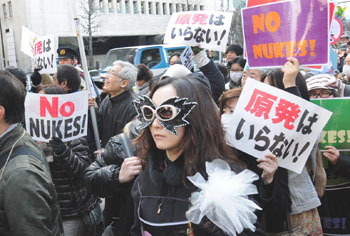 Thousands of antinuclear protesters took to the streets of Tokyo and other cities Sunday, the first anniversary of the earthquake and tsunami that triggered the nuclear crisis at the Fukushima No. 1 power plant. Near the head office of Tokyo Electric Power Co., which runs the crippled complex, demonstrators called for the country to abandon nuclear power and restore the prefecture, where more than 100,000 residents were forced to relocate. In Koriyama, Fukushima Prefecture, some 16,000 people attended an antinuclear gathering in the city and called for scrapping all of Japan’s 54 commercial reactors, which provided a third of its electricity before the Fukushima disaster. In Shizuoka Prefecture, about 1,100 people gathered to pressure Chubu Electric Power Co. to scrap its reactors at the Hamaoka power plant. The reactors were halted last May at the request of then Prime Minister Naoto Kan, who was concerned about risking a quake long predicted to hit the area. In Fukui Prefecture, about 1,200 people, including members of citizens’ groups, marched in Tsuruga, which hosts the experimental Monju fast-breeder reactor and Kansai Electric Power Co.’s atomic reactors. They rallied against restarting two of the reactors at Kepco’s Oi plant despite government approval of safety tests on the reactors, which were idled for regular checkups. The approval leaves the final decision on restarting them to the government of Prime Minister Yoshihiko Noda. “What we need to do, after witnessing how tragic Tokyo Electric’s Fukushima No. 1 nuclear plant accident is, is to build a society that does not rely on nuclear plants,” said Fujio Yamamoto, who leads a group involved in organizing the protest. Similar protests were held in other prefectures that host atomic plants or related facilities, including Saga and Aomori. In the cities of Hiroshima and Nagasaki, atomic bomb survivors took part in antinuclear protests and urged the country to stop relying on nuclear power. Thousands converged on Tokyo’s Hibiya Park over the weekend to hold candlelight services, play music and offer prayers to commemorate the first anniversary of the Great East Japan Earthquake, one of the largest of many such rallies and gatherings across the capital. Nonprofit groups and nongovernmental organizations at the park in Chiyoda Ward set up booths and tents where they handed out pamphlets calling for aid for the crisis-struck Tohoku region and to share their thoughts on the year. Watanabe, who works for a food services chain in Iwate, was selling local produce including garlic, shiitake mushrooms and asparagus at her booth. “I feel that it is my job to continue spreading what is going on in the area” to keep the memory of the March 11 tragedy from being forgotten with time, she added. A speech by naturalist and TV commentator C.W. Nicol at Sunday’s event was followed by a moment of silence at 2:46 p.m., the moment the quake struck one year ago. “Each of us must think and do what we can for the future of Japan,” Nicol, a forest conservation activist and contributor to The Japan Times, told the crowd. Event organizers said up to 30,000 people were at the park on Sunday, while about 9,000 visited the previous day. Grammy award-winning composer Ryuichi Sakamoto also took the stage to deliver a message. “It has been a year and we still don’t know how to handle” the nuclear waste and fallout, Sakamoto said, criticizing the government for continuing to claim that the crippled nuclear power plant is under control.